Perhaps you round out your child’s lunch with popular, healthy-sounding extras like cereal bars, fruit roll-ups, mixed fruit cups, cheesy snacks and fruit drinks. However, unless you’re in the habit of carefully screening product labels for artificial ingredients, you’re probably unaware that synthetic food dyes are likely packed into that lunchbox too. A single item might contain as many as four or five. Not so in the U.S. where an advisory panel to the Food and Drug Administration (FDA) just concluded in April 2011 an inquiry into the safety of synthetic food dyes and decided there was insufficient evidence to warrant tightening of regulations. The inquiry was prompted by a petition from the Center for Science in the Public Interest (CSPI) to ban all synthetic dyes in foods based on research suggesting they pose risks of cancer and allergic reactions, as well as hyperactivity in children. There are currently nine FDA-approved synthetic food dyes, and many others once in use have been banned. Recall, for example, when Red Dye No. 2, found in a wide range of products from ice cream to frankfurters, was outlawed in 1976 because of suspected carcinogenicity. The FDA does not set limits on how much dye is allowed in foods, stipulating only that the amount should not exceed what is needed to achieve the desired effect. Consequently, the food industry adds more than 15 million pounds of synthetic dyes to processed foods annually, and per capita consumption has risen five-fold since the 1950s. The FDA’s primary form of oversight is that every batch undergoes testing to assure that legal levels of contaminants – like lead, arsenic and benzidine – are not exceeded. Although it should come as no surprise that vividly colored products, like Lucky Charms cereal or M&M’s candy, contain an array of synthetic dyes (ever heard of a naturally blue food? ), some examples serve to illustrate how commonly they are added to processed foods in general. Betty Crocker Strawberry Fruit Roll Ups are colored with Blue 1, Yellow 5, Yellow 6 and Red 40. Jell-O chocolate pudding mix contains Blue 1, Yellow 5 and Red 40. Kraft Macaroni and Cheese has Yellow 5 & 6. The black in Twizzlers Licorice Twists derives from Blue 1 and Red 40, and maraschino cherries get their “day glo” red hue from Red 3 or Red 40. Nacho Cheese Doritos are colored with Yellow 5 & 6 and Red 40. Even salad dressings can be dyed – Ken’s Steak House Raspberry Walnut Vinaigrette contains Blue 1 and Red 40. To substantiate the claim that synthetic food dyes are unsafe, CSPI released a report in 2010 titled “Food Dyes: A Rainbow of Risks” which summarizes the available health safety studies in animals and humans. In addition to the body of evidence linking the dyes to hyperactivity in children, eight dyes have either been linked to cancer directly or through their contaminants. CSPI points out that children’s bodies are still developing, so any health risks would likely be amplified in youngsters. Synthetic dyes have no known nutritional value. Their chief purpose is to catch the eye of children or to increase general appeal by capitalizing on the colorfulness people associate with healthful fresh fruits and vegetables. They’re also generally cheaper, brighter and more stable than so-called natural food colorings derived from plants, minerals or animals. 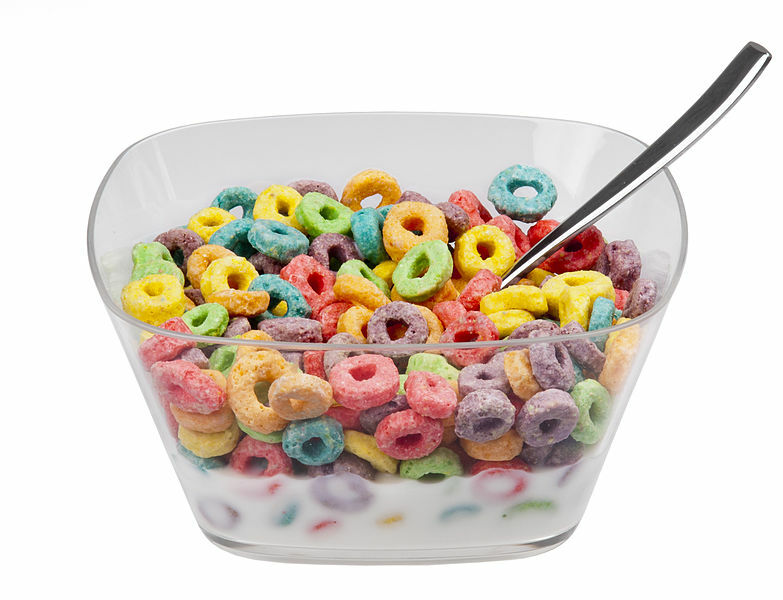 The list of FDA-approved sources for natural colorings is long and includes beets, carrots, grapes, tomatoes, elderberries, purple corn, red cabbage, sweet potatoes, annatto tree seeds, turmeric, paprika, chlorophyll, iron, titanium dioxide and a bug called Coccus cactic L.
Any argument from the food industry that synthetic dyes are indispensable is easily countered by the fact that they have been largely replaced with natural alternatives, or simply eliminated, in Britain and Europe. For example, McDonald’s colors their strawberry sundaes with Red 40 in the U.S. but uses only real strawberries for color in Britain. Similarly, beetroot, paprika and annatto are substituting in Britain for the three artificial dyes used in Kellogg’s Strawberry Nutri-Grain Bars sold in the U.S. Though controversy exists as to whether natural food colorings offer any health benefits such as from antioxidants, there seems to be no debate that they are at least not harmful. It seems unlikely that the FDA is going to rein in the use of synthetic dyes in foods anytime soon, so it’s up to consumers to express their preference for natural coloring agents – or maybe better yet for no added colorings – by scanning product labels before purchasing. Because law requires that only artificial flavorings (not artificial colorings) must be labeled on package fronts, look for the ingredients label where added colorings are listed. Also, several brands of processed foods are marketed today as free of all artificial ingredients and post labels to that effect right on package fronts. The take home lesson about synthetic food dyes is that health-conscious consumers might try eating a little less with their eyes and a bit more with their brains. This entry was posted on Saturday, December 3rd, 2011 at 5:23 pm and is filed under diet, health, science, sustainable living, toxics. You can follow any responses to this entry through the RSS 2.0 feed. You can leave a response, or trackback from your own site. ugh…..how can anyone be surprised that there are so many more cancers now? Fabric dyes and food dyes extracted from natural herbs & plants are not really expensive and available abundantly in many Asian countries and South Amercian countries. I wonder, what then, keeps US manufacturers to use synthetic food dyes instead of exploring the cheaper , healthier counterparts of these synthetic dyes. Is it the low cost or regulations?